The residual vibration caused by joint flexibility tends to be nonlinear and time-varying due to the complicated dynamics characteristics of 6-DOF industrial robot. To address the time-varying residual vibration problem, this paper proposes a pre-adaptive input shaping method. 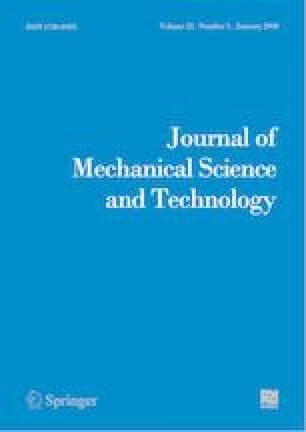 By simplifying the 6-DOF industrial robot standard flexible dynamics equation, the flexible dynamical parameters can be identified without additional joint encoders or other measuring instrument, while the natural frequency of each joint can also be calculated from the identified dynamical parameters. Then by setting the calculated natural frequency as the initial condition, an iterative learning scheme based on the secant method can be applied to obtain a better natural frequency estimate. Finally, using the iteration results, the input shaper’s parameters can be updated, which makes the shaper adapt to the variation of system parameters. The results of model validation show that the simplified dynamic model can reflect the robot dynamic characteristics accurately. The vibration experimental results demonstrate the effectiveness of the proposed pre-adaptive input shaper in suppressing the residual vibration. Tie Zhang received his Ph.D. from South China University of Technology in 2001. He is currently a Professor and a Ph.D. candidate supervisor of the School of Mechanical & Automotive Engineering, South China University of Technology. His main research interests include design and control of robots, automation and intelligent systems.